There's a significant, but temporary change coming our way. This weather forecast goes from warm to (somewhat) wet to cool to warm, and I'm still liking how the holiday weekend outlook is shaping up. It's actually cooler than I expected Thursday morning. I said "lows around 60," but we've got widespread 50s for all but the Jersey Shore. Some patchy dense fog has developed, with visibility as low as a quarter-mile in spots. Based on satellite trends, I think we'll have abundant sunshine to start Thursday (well, after any fog burns off). Clouds will increase this afternoon, and you'll feel a noticeable uptick in humidity too. 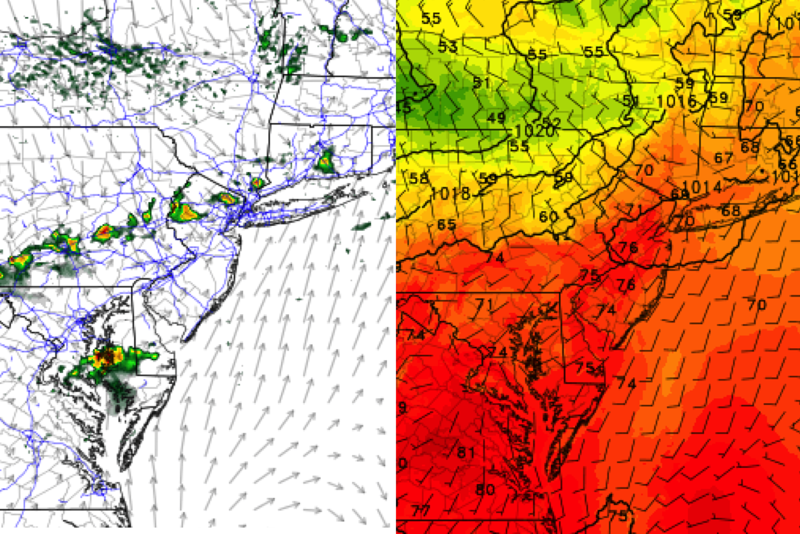 High temperatures will once again end up well above seasonal norms, in the upper 70s (NW NJ and coast) to lower 80s. A cold front is set to impact New Jersey Thursday evening. An isolated shower will be possible as early as 4 p.m. Thursday, but most rain activity should be limited to 7 p.m. and beyond. The rain looks scattered — i.e. hit or miss. While there could be some localized downpours and rumbles of thunder, I think the threat for strong to severe thunderstorms will be low this time around. Any and all rain should exit the state by 2 a.m. Friday morning. Then, behind the aforementioned front, a brisk northerly wind will gust as high as 25 mph. That wind will carry in cooler, drier air. Skies look to remain mostly cloudy to overcast on Friday, contributing to stagnant thermometers. High temperatures are forecast to get stuck in the upper 60s to maybe 70 degrees. It's worth noting that this is a "middle of the road" forecast. The GFS model trends slightly sunnier for Friday afternoon, which would open the door to more widespread 70s. On the other hand, the NAM keeps thick clouds overhead all day, with even cooler temperatures in the lower to mid 60s. All solutions show a dry weather day. It will probably remain breezy for the first half of Friday too. Sunday will be the warmer day of the weekend, with a few extra clouds building into the sky. High temps look to return to the lower 80s. Columbus Day Monday also looks fine n' dandy, with a mix of sun and clouds and highs near 80 degrees. Maybe an isolated shower or sprinkle, but I wouldn't bet on it. In fact, our next substantial rain chance doesn't show up in the forecast models until Thursday. Looking long-term, my weather-spidey-senses are leaning toward a big cooldown around next weekend. That could lead to our first frost of the season in North Jersey within the next 10 days or so.